Ted Haggard arguing against evolution on video with Richard Dawkins (foreground, from behind)—see text. When any significant Christian leader falls from grace in a major, public way, to say that it’s painful for God’s people is an understatement. 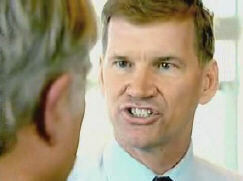 The recent scandal involving Ted Haggard has reverberated around the globe. It is in many ways perhaps the most disastrous of such episodes that many of us have observed in our Christian lifetimes, involving as it did one of the most powerful and prominent evangelicals in the world. This man was not only the pastor of a huge church, he was the head of the largest association of evangelicals in America, and hence the world. He apparently had the ear of the White House, too, with weekly phone conferences with the President. The facts need no repeating. Especially painful to contemplate is the video being shown widely on the net, where aggressively atheistic Darwinist Richard Dawkins interviews Ted Haggard, who is seen staunchly arguing with Dawkins against evolution (obviously recorded before these sad revelations). [Note, Dawkins made sure that well-informed criticisms, such as by Dr Alister McGrath—a fellow Oxford professor—were left on the cutting room floor. See Do stop behaving as if you are God, Professor Dawkins—Ed.]. Actually, nothing much more than the obvious; that in a fallen world full of fallible, sinful people, what people do, and what they say, don’t, unfortunately, always correlate well. Of course, it is precisely this, the perception of massive hypocrisy, that has caused much of the shock and hurt, and has made the Christian community in general so much more vulnerable to criticism. If a leading atheist had done what Haggard did, it would have caused barely a ripple. But someone who was making a strong and persistent public stand, on behalf of millions of other believers, and on behalf of God’s Word, against ‘gay marriage’ and other forms of homosexual sin, and then engages in such practices himself … that is a different story. In fact, the very pain of hypocritical actions in a preacher has something to do with our innate recognition that something intrinsically good has been debased and let down by his failure to meet the standard that he proclaimed. Hence the saying, ‘Hypocrisy is the compliment vice pays to virtue.’ It stands to reason that saying the right thing and doing the wrong thing is better than saying AND doing the wrong thing. Indeed, what would have happened if Haggard had come out of the closet on his own and bashed the church for repressing gay sexuality? Judging by its record of lauding gay bishops, the generally anti-Christian media would be hailing Haggard as a brave maverick who had boldly thrown off the chains of organized religion to embrace self-actualization. We would hear very little of his hypocrisy of not following the book he claimed to believe in, or of betrayal of his family. About the only thing that the media seems to have against Haggard is that he now seems to be repentant, spoke out against homosexuality while practising it, and has not resiled from that. But there is good news in all of this for the Bible-believer, in that the Christ and the Christianity of the Bible remain unblemished and, in a sense, vindicated. Today we are in the era of big movements, big projects and big-name leaders, the risky ‘celebrity model’ as Nancy Pearcey’s classic book Total Truth describes it. To fulfil His purposes, God does not need any of us or indeed any of our man-made institutions—but He does want us to do as the prophet Micah (6:8) said—to ‘do justly, and to love mercy, and to walk humbly with [our] God’. The very pain of hypocritical actions in a preacher has something to do with our innate recognition that something intrinsically good has been debased. On the other hand, consistent evolutionism gives no basis for calling anything ‘good’ at all (or ‘evil’ for that matter). When a committed evolutionist like Hitler carried out his pledge to serve mankind by struggling against weaker, inferior ‘races’, he was utterly wrong, but he was being totally consistent to the standard he proclaimed. No-one can call him a hypocrite. In fact, within his own worldview, it is hard to call him immoral (by what standard can we judge him, if we are nothing other than rearranged pond scum, the outcome of eons of struggle, with the strong wiping out the weak?). Many have tried to claim that our emphasis on the link between social decay and departure from belief in divine creation means that we think evolutionists are immoral, and creationists moral, end of argument. But this is a caricature—see Evolution and Social Evil, and the explanation of the moral argument in this feedback. An individual evolutionist may lead an outwardly very moral life, maybe even more so than some creationists. But that does not alter the fact that on the whole, society will become (and has become) less moral, moving away from biblical absolutes as it realizes that consistent evolutionary thinking leaves no logical, objective basis for morality. Why should anything be called good or bad? Who says? By what standard? Without God, everything is up for grabs. Indeed, Haggard’s opponent in the documentary exchange, Richard Dawkins, agreed elsewhere that evolution ‘leads to a moral vacuum … in which their best impulses have no basis in nature’. He scoffs at the idea of righteous indignation and retribution against child murderers and other vile criminals, claiming that it is as irrational as Basil Fawlty1 beating his car. 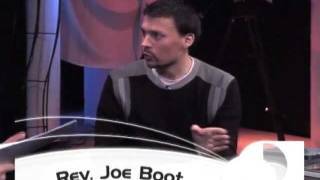 And of course, in the evolutionary mindset, there is certainly no need for the salvation Christianity offers, as without any Adam, there is therefore no original sin. Many evolutionists profess to be ‘people of faith’—but faith in what? How can we know anything at all about God, unless He has chosen to give us a trustworthy revelation? And if we can’t trust that revelation (the Bible) to be reliable in one area (e.g. science/history) how can it be trusted elsewhere (cf. Jesus’ saying to Nicodemus: ‘If I have told you earthly things and you do not believe, how can you believe if I tell you heavenly things?’ (John 3:12))? This is why the message of the authority of the Bible, from cover to cover, is more important than ever in this day, despite (perhaps even because of) the transgressions of those claiming to champion it. 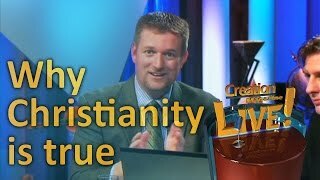 Knowing that someone is publicly committed to the authority of the Bible in all things (including creation) will not give a waterproof insurance policy that he/she will never be engaged in something that opposes that very authority—for the same reason that all of us sin (Romans 7:15–24, 1 John 1:8). There is also some chance that a person who has fallen from grace may not be a believer at all, but a ‘tare’ (Matthew 13:24–30). He/she may have chosen to ‘go along’ and ‘play the game’ because it is such a great career opportunity, or for the fame or adulation, etc. For all we know, Haggard, like the late evangelist Charles Templeton (who renounced his professed faith entirely), may have developed personal doubts about the reliability of the Bible because of the persistent evolutionary indoctrination of our age. Such doubts would make giving in to temptations just that little bit easier to justify. Even if not, and Haggard never ceased to believe in the truth and authority of the Bible, there is no doubt that the changes in the culture itself, brought about by its general movement away from biblical absolutes, have made it more ‘respectable’ and somehow easier for even believers in those absolutes to give in to temptations to sin, which bombard them from every angle. Those bombardments themselves have increased in proportion to the retreat of Christian influence in culture in general. Even 30 years ago it would have been much more difficult to find the means to engage in such sin. Laws against wrongdoing (as well as general societal disapproval) certainly increase the difficulty and shame of sinful acts (Romans 13). There is more, too, that needs to be said in relation to the link between moral decline and evolution—and the importance of repeatedly stressing that link. It is an obvious fact (one that no amount of sinning by any professed creationists can affect) that no-one who stands for the authority of the Bible in the area of six-day creation will simultaneously be found lobbying for the diminution of biblical authority in other areas, such as the ordination of homosexual clergy, for example. Those in the clergy, or in the pews, who defend such things as this will never be found defending the Genesis record of creation as factual and historical. On the other hand, if someone is defending the six-day creation record of the Bible, then whatever their private inconsistencies, they are making a public stand for the authority of the Bible in the area where it is perhaps the most unpopular. By default/definition, then, in other areas, such as legislative attempts to undermine public respect for Christian morality, etc., they will be standing for biblical authority, too, at least in public. And that cannot be a bad thing. One needs to remember that all of the advances in society which we look back on with favour—the abolition of slavery and child labour, as well as hospitals (care for the sick), prison and orphanage reform—even the blossoming of science and technology itself, have all come about directly from the light of the Gospel being allowed to permeate the culture, despite the failings of individual believers (see aslo Christianity’s Real Record by Gregory Koukl, off-site). Ted Haggard’s departure from his post is of course appropriate. Scripture throughout condemns homosexual activity as one symptom of sinful lusts, in turn arising from a rejection of God (Romans 1:20–32). This is largely because it violates the created design of marriage as a man and a woman, endorsed by Christ Himself (Matthew 19:3–6, citing Genesis 1:27 and 2:24). And a sexual sin is especially serious because it is ‘against one’s own body’ (1 Corinthians 6:18), and can often be ‘a sin that leads to death’ (1 John 5:16). All the same, we also do well to consider that it is not the only sin in the book, and it is not the ‘unforgivable sin’ either. The Bible calls homosexual behaviour an ‘abomination’; but the same word (Hebrew תועבה / תעבה to‘ebah) is also applied to a proud look and a lying tongue, for example (Proverbs 6:16–19). Such sins are not exactly absent from the church in general, including those in the eminent corridors of ‘Christian power’, but it is unlikely that their practitioners will suffer public disgrace. Basil Fawlty was the character played by John Cleese in the classic British TV comedy series Fawlty Towers. He was prone to angry, irrational outbursts blaming others for his problems. In one episode he took out his frustrations on his vehicle by beating it with a tree branch. Return to text.